To be admitted to a private centre such as CUCC, you must follow the General Admission Procedure of the Single University District of Madrid. This process starts with pre-enrolment during which you select up to twelve study programmes in order of preference. After obtaining your admission results, you can proceed with enrolment. The process involves three simple steps. The first step in applying for a place at the university is pre-enrolment. You can pre-enrol after sitting the University Access Assessment (EvAU) test or if you meet the admission requirements (university access pathways). There are two pre-enrolment periods: the first (ordinary) is in June and the second (extraordinary) is in July. 1st period (Ordinary): 11 June - 2 July 2018. 2nd period (Extraordinary): 20-27 July 2018. 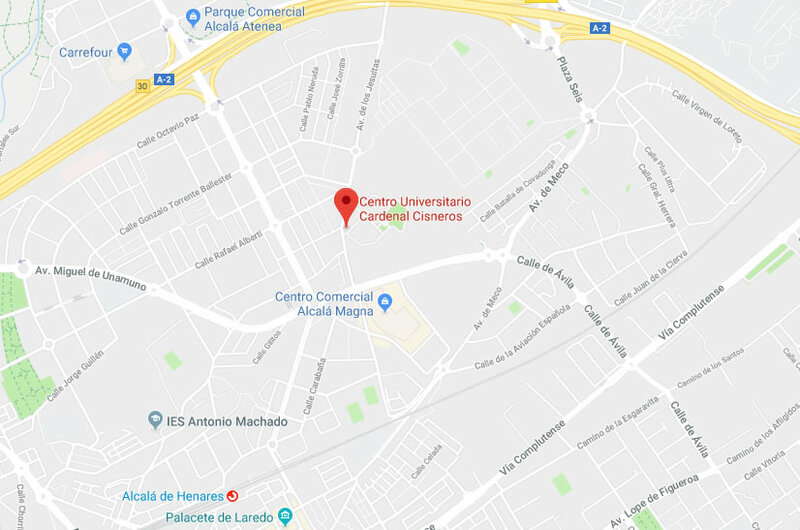 The Centro Universitario Cardenal Cisneros is a private centre that is administratively linked to the University of Alcalá. Therefore, all new incoming students wanting to enter an undergraduate programme at CUCC must apply through the pre-enrolment application of the single university district of Madrid and put CUCC as one of their preferences. Click here to pre-enrol online. Make sure to follow the enrolment instructions carefully and submit the required admission documents. If you want to apply for a place at CUCC starting in September, please check the deadlines and required documentation. When submitting your pre-enrolment application, remember to select the “Bilingual Group” option as one of your preferences. You are also recommended to include other options so that, if your English level is not high enough, you can still enter one of our Spanish groups. You will be required to prove that you have at least a B1 English level with an official certificate (click here for a list of valid certificates). Alternatively, you can sit an English level test at CUCC before completing enrolment. The English level tests are held on the CUCC campus and are conducted by specialised teachers. The test lasts approximately 60 minutes and includes grammar, vocabulary, comprehension, and speaking parts. The purpose of the test is to check that applicants have an intermediate level of English (B1). Time: 10.00 a.m. and 11.30 a.m. Time: 10.00 a.m. and 11.30 a.m.
A copy of the University Pre-Enrolment Form. A copy of your DNI (Spanish ID). Over the next few days, you will be notified of the test results by email. The email will simply indicate if you "PASSED" or "FAILED". If you obtain a PASS, you will be authorised to pre-enrol for a Bilingual Group on one of the Education Degree Programmes at CUCC. However, please wait to check the list of successful applicants to confirm your place before completing enrolment. When the pre-enrolment period ends, universities publish their admission lists based on the number of applications received and available places. Therefore, remember to check the admissions lists on the pre-enrolment application of the Single University District of Madrid. If you are successful, you are eligible to enrol. Non-admission appeal application (Download PDF). A photocopy of your Spanish ID (DNI). A photocopy of your access document: University Entrance Exam (PAU) Card, Official Academic Certificate of Educational Programmes or University Studies. The enrolment process can be formalised once the places have been offered to new incoming students. If you have been offered a place, you can proceed with the self-enrolment process. Once completed, please submit the required documentation in person or send it by registered mail to CUCC. You can self-enrol online HERE. Also, if you are a new student, you can come to the CUCC campus where staff from our Information Service will guide you through the enrolment process on our computers. A signed copy of the self-enrolment form. A copy of the pre-enrolment form. A photocopy of your access document: University Entrance Exam (PAU, EvAU) Card, Official Academic Certificate of Educational Programmes or University Studies. A legible and up-to-date photocopy of your Spanish ID (photocopied, not scanned). A photocopy of the administrative fee payment receipt (€200). The administrative fees must be paid into the following Banco Popular Español account: ES69 0075 0273 59 0600155000. Students who apply for a Ministry of Education Scholarship or any other type of grant or financial aid (e.g., for large families, disability, etc.) must also attach the appropriate documentation. For record transfers: Any students who request a transfer of their academic record and have previously started a study programme in another university, or who have taken the university entrance exam (PAU/EvAU) in a single university district other than Madrid, must attach a copy of the transfer fee payment receipt. If you want to transfer your previously obtained university credits, please check the instructions and deadlines. In addition, when you enrol, please pay special attention to which subjects are eligible for credit transfer.